Being ready for game night is job one for the Buckeye Valley High School Flag Corps. The rain didn’t stop the team from practicing Thursday afternoon while it poured rain outside. 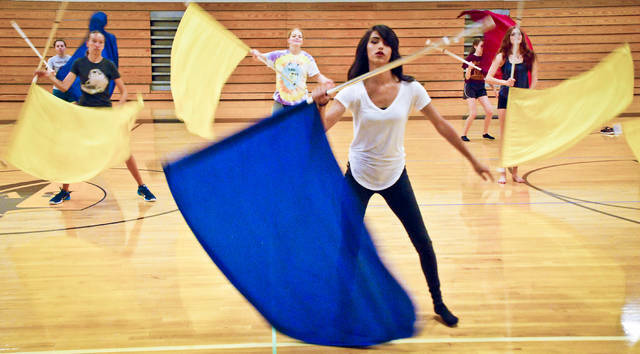 The team moved the practice into the gym where they had room to spin, twirl and toss flags into the air. On the front line, one of the team captains, Tara McClure, spins her flag in time with the music during the routine. This entry was tagged Buckeye Valley, delaware, Flag Corps., ohio. Bookmark the permalink.